Zawieszka, Sycylia, początek XII i 2 poł. XIII w.
One of the most valuable treasures discovered in Europe in the 20th century is shown in Wrocław, in a newly arranged celebratory display during the last three months of this year. Our visitors are able to admire such artefacts as the crown of truly exceptional quality made in the early 14th century – following the new reconstruction and conservation work, also a 13th century cameo clasp and gold pendants dating from the late 12th century. 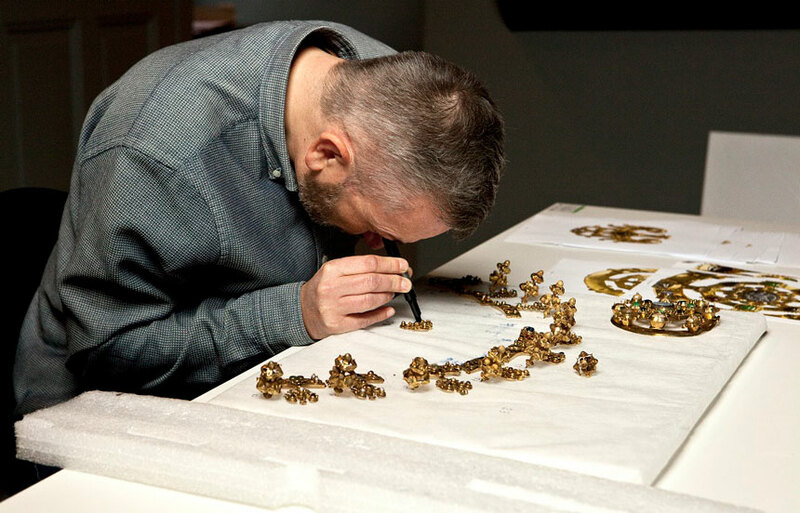 The exhibition has been organized to commemorate the 30th anniversary of the discovery of the treasure, regarded as one of the most significant finds of its kind in Europe, primarily due to the presence of the absolute masterpiece of medieval goldsmithery: a woman’s gold crown of unmatched beauty and artistry. For the first time the entire hoard is showcased together: jewels, gold and silver coins, also those which had been found in Środa Śląska three years prior to the great discovery, and the pieces of ceramic vessels in which the treasure was hidden by its owners in the Middle Ages. The jubilee exhibition is further enriched by new elements illustrating the circumstances of the events which took place three decades ago, including also archive materials from that time: photographs, drawings and documents. Additionally, the National Museum has conducted a research project whose results are presented in the exhibition. The crown is the most valuable part of the Środa Treasure. It is a woman’s crown commissioned on the occasion of a wedding, which is clearly indicated by the rings motif – a sign of marital commitment and symbol of a good omen. The crown belonged to the Czech queens, and its last owner could have been Blanka (Blanche) de Valois, the first wife of Charles IV of Luxembourg. This priceless piece was created in the early 14th cent. 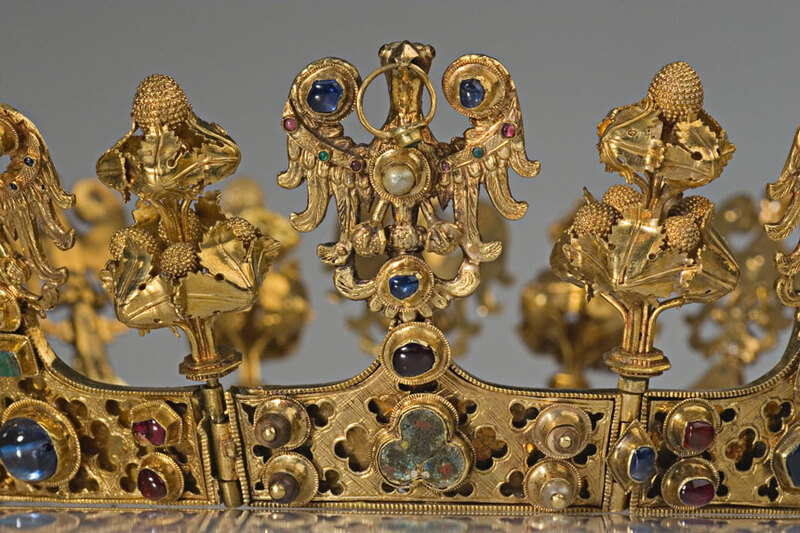 It is the only surviving medieval crown of this kind, and its exceptional value is further augmented by the supreme craftsmanship of the goldsmith. The second most valuable piece of jewelry is a round clasp, decorated in the centre with a chalcedony cameo depicting the imperial eagle. Around the cameo and along the inner ring of the clasp precious stones – garnets and emeralds – are set, while the outer ring retains a sapphire and pearls circled by garlands of emeralds and garnets. Such clasps were used to fasten ceremonial cloaks of courtiers as well as the coronation and liturgical robes. 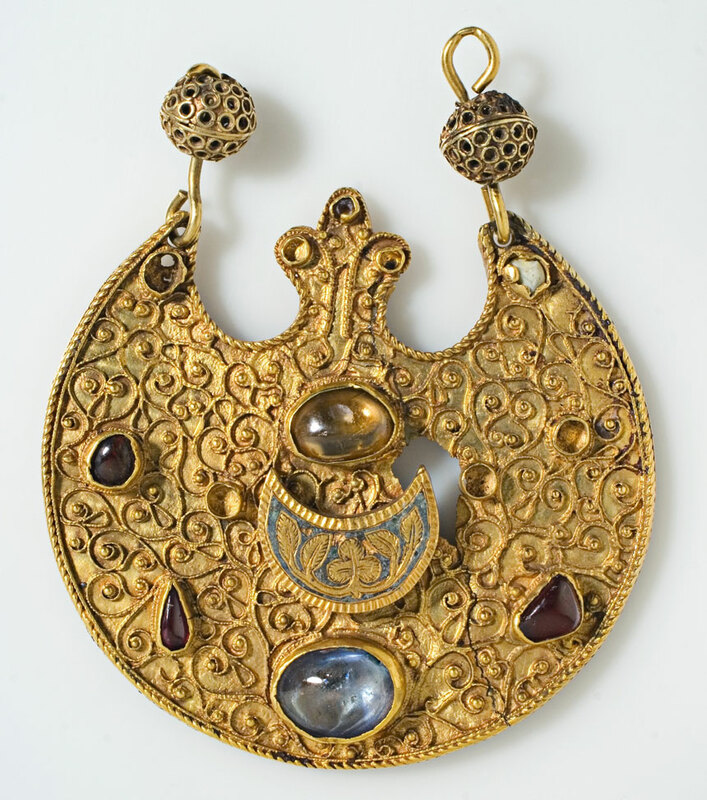 Other exhibits on display are the gold pendants dating from the late 12th cent. and the 13th cent., used to adorn women’s heads (decorated with filigree as well sapphires, citrines, garnets and pearls), a buckle with a bird figurine, gold rings, ornamental strips used as edging for precious objects, as well as gold and silver coins. The place and probable time of hiding these precious objects – before the mid-14th cent. 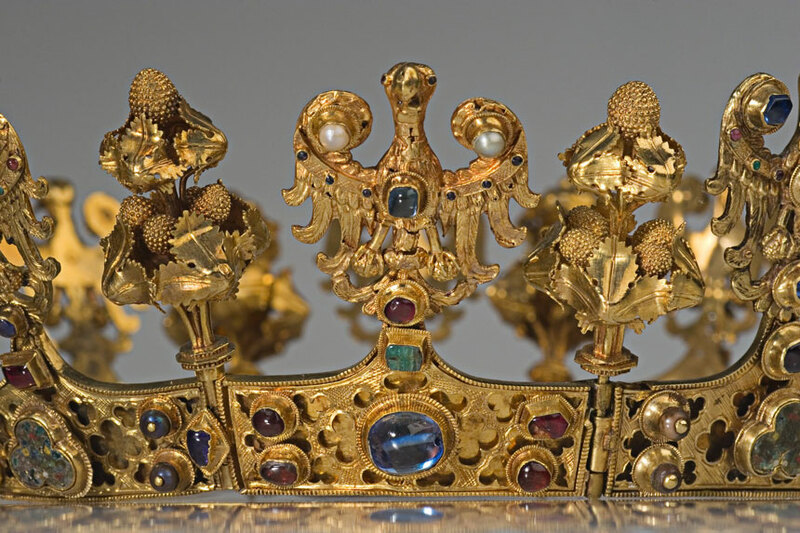 – and the character of the jewels allow us to speculate that they constituted a bank collateral which had originated from Prague, from the Crown Treasury of the House of Luxembourg. The valuables found their way to Silesia, which was then part of the Czech Crown, during the rule of Charles IV. It has been known that the King borrowed heavily from the rich merchants of Środa Śląska in order to finance his political campaign to obtain the imperial title. 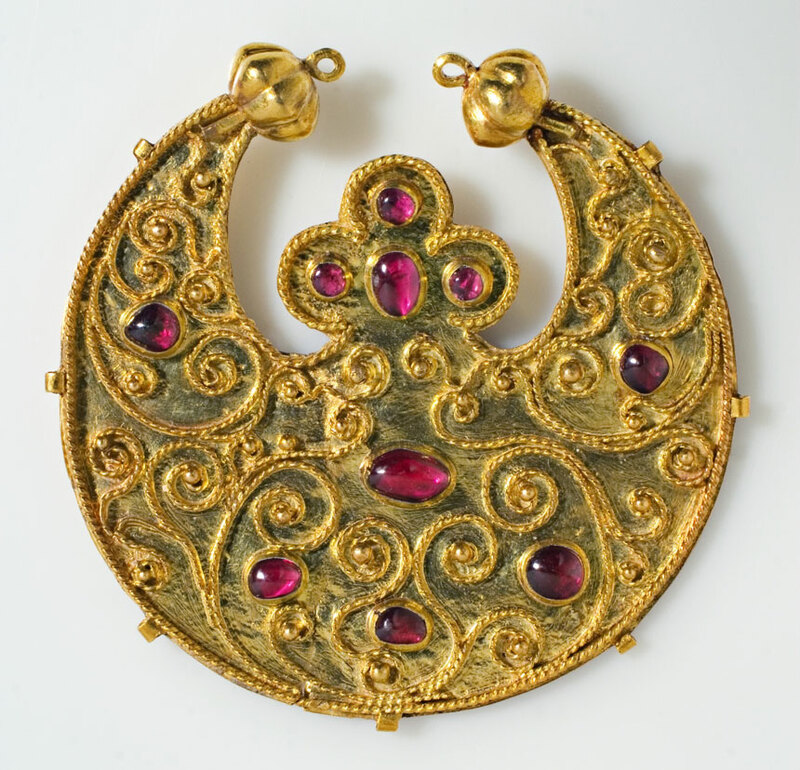 The treasure was placed in the collection of the National Museum in Wrocław, and was first shown to the public in 1996. 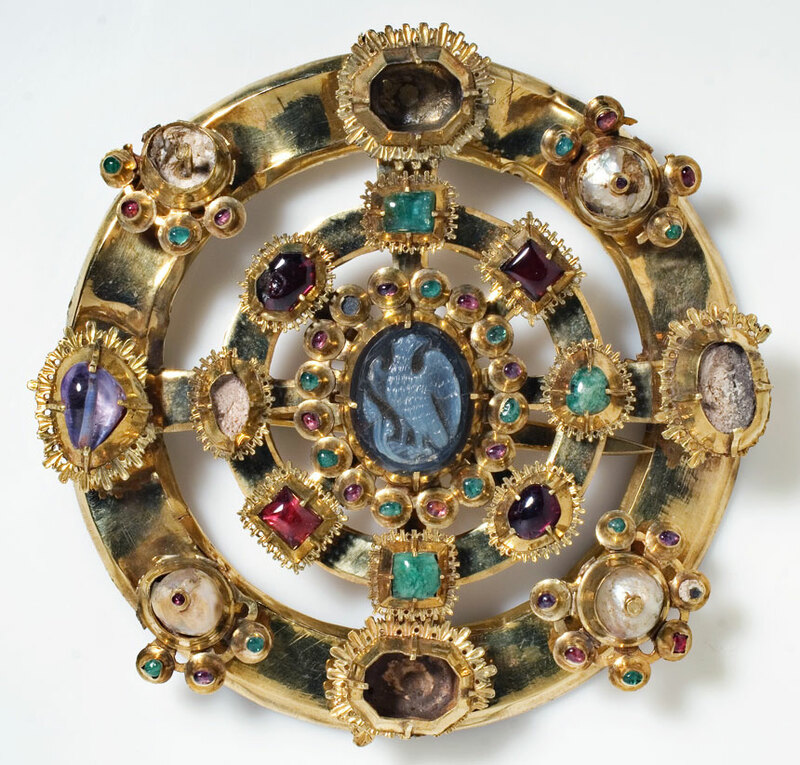 The Środa Treasure is exhibited annually in the National Museum in Wrocław during the last three months of the year, and for the remaining nine months it can be viewed in the Regional Museum in Środa Śląska.